Being leading software in the taxation industry, the Complaw has become a prestigious tool in the field of integrated software for the solution of ROC e-Forms, XBRL, Resolutions, Minutes, Registers & various MIS reports. The SAG Infotech Complaw is fast, efficient and reliable to perform the tasks with perfection in each and every bit. 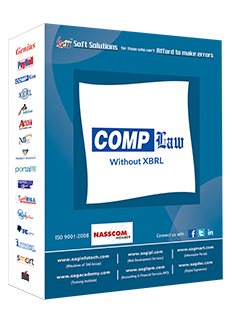 Looking at the huge demand, the Compalw is now available without XBRL also, which has a wide range of scope and possibilities. 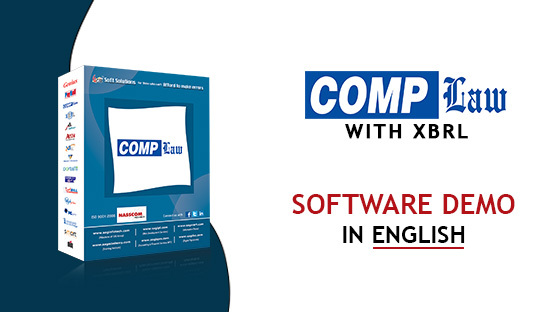 Company law software has been updated with the newly prescribed Companies Act, 2013. Various kinds of Resolutions(i.e.Ordinary,Special and Board Resolutions) as per new Companies Act 2013. Formats of Minutes of various meetings (i.e.AGM, EOGM and Board Meeting). Statutory Registers formats as per new Companies Act 2013. Preparation & e –filling of balance sheet, profit & loss A/c in XBRL format as per taxonomy & validation tool of MCA. Format of Directors Report as per Companies Act, 2013. Generation Memorandum & Articles of Association. Generation of Resolutions of both the types ordinary & special. Generation of notices for the meeting. Generation of minutes book like board, AGM & EGM. Generation of fixed assets registers with depreciation chart as per income tax act & companies act. Generation of digital signature register. It gives a facility to generate various kind of bills and receipts. Scheme forms like: - EES, FTE & CLSS etc. Penalties - It’s a suggestions which give you the information that according to section who is liable for the penalty amount of particulars’. Administrator is having import & export facility of balance sheet & loss account through MS Excel (Form-23AC & 23ACA) respectively. It allows the administrator to import previous year balance sheet & profit & loss account from form-23AC &23ACA respectively. Facility of pre-fill company and master data. Administrator is having facility to import auditor’s master detail from form 23AC. To save the time we have special provision to download all the latest versions of e-forms directly given on the MCA website. Administrator uses this option to attache those documents in the software which automatically associates with the pdf file. Administrator is having facility to create Director, Shareholder, CA, CS relative master which avoids duplicity of data. Administrator is having facility to create masters (resolution, minutes and agreement, etc.) with customization facility which avoids repetition of data. Facility to covert word and excel files into PDF. Administrator can select authorized signatories from the list of directors authorized to sign the e-form. Administrator can log in company wise in our software. Administrator can log in directly to the MCA portal in order to upload the e-forms. Administrator is having facility to create backup & restore data of single company or of complete software. Administrator can maintain telephone directory. Administrator can manage client wise scanned documents & label printing.